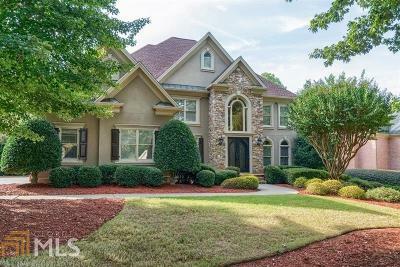 Updated and extremely well-maintained Sugarloaf Country Club home beautifully situated on large, private cul-de-sac with professionally manicured landscape. Gorgeous castle iron double doors lead to an open floor plan with grand circular staircase and decorative wrought iron scroll balusters. Unique private den or personal home study. Formal living room and banquet-sized dining. Huge master suite and enormous luxurious bath and closets. Finished lower level with large entertaining bar. 2 large porches! Huge backyard w/outdoor hot tub/spa. Directions: 85 To Exit 108. Go West To Meadow Church. Left At Light. Right Into Community. Through Gate. Turn Right On Sugarloaf Club Drive. Right On Lockerly. House On Right.